A little over a month ago we did a quick poll on what our readers thought the real rate of inflation was. The idea for polling our readers came from the disconnect between the official government rate of around 1% and what some had told me they were experiencing first hand. Thank you to everyone who participated, particularly those who shared frustrating examples of the ever-increasing cost of living. There were close to 100 pages of reader comments, and I read them all... every single word. I bought a down jacket from L.L. Bean four years ago for $100. Today, that same jacket is $250. You know you have inflation when even the price of down is up! The weighted average for our reader-reported inflation rate is 8.07%. 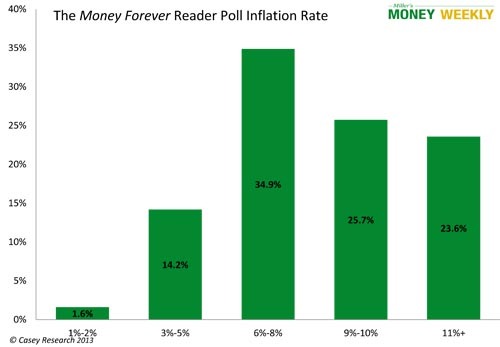 We are rounding this to 8%, and calling it the Money Forever Reader Poll Inflation Rate. We will use this rate in examples and graphs throughout the year, along with the BLS Rate and the Shadow Government Statistics' alternate rate. I know our rate is unscientific, but I trust our readers more than I trust the Bureau of Labor and Statistics. In addition, Vedran Vuk, our senior research analyst at Miller’s Money Forever prepared the graph below showing the distribution of responses. We were hoping for a bell-shaped curve, but you will notice it stops with 23.6% of the respondents reporting that they believe inflation is 11% or higher. In light of this, we will add higher rate choices the next time we run our survey. There is no choice for 0-1%, -1%-0%, etc. I have found prices to be deflationary. Consider what my family buys on a regular basis and the trend since last year. Food: 2%; Gas: flat; Consumer electronics: -10 to -20%; Wood pellets: flat; Cord of wood: -10%; Kids' preschool and babysitting: flat; Propane fuel for heat/hot water/cooking: -25%; Labor for electricians/plumbers/landscaping: flat; Electric bill: flat; Construction materials: -5%; Skiing: +3%. Many of the responses varied based on where the reader lives. I track all my expenses using Quicken. My expenses in 2012 have gone up as follows: Groceries, +10%; utilities and property taxes, +9%; gas/diesel for vehicles, +1%. I chose that example because of the property taxes. Many folks mentioned real-estate tax increases. In my case I have two homes, one in Illinois and one in Florida. Both were assessed at lower rates after the 2008 real-estate crash. My FL real-estate taxes have decreased accordingly. However, in IL they just changed the formula, and my taxes keep going up despite the decreased value of my home. Like many of the examples, it depends on where you live. There were hundreds of examples of price increases due to smaller package sizes and/or reduced quality. I am retired now, so my principal purchases are food, gas, and some clothing. … As to clothing, while Kohl's pricing looks great, the cotton thread count in Dockers pants is way down, and they wear and fray out a lot sooner. One reader mentioned how much easier it is to carry home $100 in groceries, while another said he thought he was just getting stronger. It looks like the cost of hosting a party is increasing rapidly. A one-pound bag of Lay's Potato Chips used to cost $0.99. It is now 10.5 oz. and costs $4.99 if you can't find it on sale. Stroh's beer cost me $4.39 a 12-pack at Food Lion before I left for Australia for 17 months in April 2011. It now costs $8.89 – up 100%. Schlitz and Pabst Blue Ribbon also went up 100%. Nuts that used to cost $9.99 at Costco now cost $18.99. There are specific items that have gone much higher: quality cheeses have gone up double digits. My favorite cheese (Hoffman Sharp Cheddar) had a price jump of about 12% – about the same for Bass Ale. The cheapest wine in California known as "2-buck Chuck" recently went against its famous name and raised the price from $1.99 to $2.49! That's a 25% increase. Many folks mentioned the cost of meat. Groceries are the worst – but not all groceries. Three years ago, when I moved here, I could catch bacon on sale for $1.79/lb. Now they advertise it for $3.50 for a 12-oz package. I asked the guy at the meat counter if they were making bacon from "gold-plated" pigs. The "sale" price on fryers is 50% (that's fifty) percent higher than last winter. And then eggs were mentioned. I live in David, Panama, and while the cost of living here is generally less than in most of the US, we have seen real inflation in three years. Here are some examples of price increases in the past year or two: a dozen eggs, from $1.59 to $2.09; a pound of good coffee beans, from $5.79 to $6.49; a pound of tomatoes or potatoes from the produce stand, from $.50 to $.80; a gallon of milk, from $3.99 to $4.49. Some things have not changed much, such as meat, poultry, and canned and dry goods. I judge real inflation by checking the price per pound of bananas at Fred Meyer's. That price has increased from 39 cents per pound at the beginning of last year to 59 cents per pound, i.e., around 50%. As a monitor I use the price of bananas. They have gone from $.58/lb. to $.77/lb. in 2012. That would be a 33% increase. Of course many mentioned McDonald's and other fast-food restaurants. I don't know the percentages, but a filet o' fish at the local McDonald's is $4.16 (including tax) – this is at Lahaina Maui (Hawaii)... the combo meals go up to almost $8.00; this is considered cheap? And not just in Hawaii. What I've used to gauge real inflation for several years now is the extra-value meals at McDonald's. Between 1 January, 2012 and 1 January, 2013, average prices have increased by over 8%. This reader takes on McDonald's, Subway, and Taco Bell. I have a couple of examples based on a few of my semi-regular activities. The first would be lunch. Personally I like Taco Bell. I know, I can already hear the groans, but frankly, I like the food and the value. At times in the past when my schedule would dictate a quick lunch out, Taco Bell would cost me $2.75. My standard order was a taco, burrito, & medium Pepsi. I loved the fact that I could eat for under $3.00. Now, I like the fact that I can eat lunch for under $4.00, but I don't love it. The second item is that our local McDonald's recently increased my "senior coffee" from 37 cents to 55 cents. All right, call me cheap. I still like my senior coffee, but I no longer love it. Oh, I almost forgot. Subway recently had their "customer appreciation" promotion for December. They advertised $2.00 for one of two sandwiches, but at our local store they said they had to charge $2.55 because of "shipping costs"? I guess they don't appreciate us here as much as other places. Restaurants in general were mentioned several times. My favorite breakfast, 3 eggs & bacon in November 2012, $4.25; 3 eggs & bacon in January 2013, $6.00. Biggest surprise over the last twelve months is the cost of dinner at our local Tex-Mex restaurant. The same basic dinners with a cocktail for each of us has risen 25%. We know the owner well, so we felt we could ask about the increased prices. He told us that everything he uses to provide his food to the customer has risen more than 20%, and then there is his staff. The word "lie" describes to a T what the government is doing to Americans, and I find it despicable. Over the past two years prices on the restaurant menus have increased three times. We can't afford to eat out anymore; back to the slow cooker. Damn, I hate to wash dishes! Even dish soap has gone up. Seems that folks in Australia have differing opinions. I live in Australia, but I couldn't resist chucking in my 2 cents worth as we share the same crime here of manipulated government CPI numbers. In the last year my estimates for price rises living in Sydney are as follows. General household & food costs, + 10%. Restaurant food, + 10-20%. Beer at a pub, + 15%. Public transport, + 5%. Electricity bill, + 30%. Council rates, + 10%. Doctor's consultation, + 15%. Petrol, + 10%. Internet ADSL costs, + 10% (to be fair this one increased last year for the first time in 6 years). On average the cost of living here has easily gone up over 10% in the last year, and the government's reported CPI figure is 2.2%, laughable. And now around the globe to Europe. I live in Norway. Large plate of sushi used to cost 155 kroner (this was in 2011). In 2012 it costs 170 kroner, almost a 10% increase. Needless to say, I don't eat out as often as I would like to now, and if I do I order a smaller size! Inflation is rampant worldwide, not just the US. Right now the Norwegian kroner and the Australian dollar are doing well against the US dollar, yet some still believe they are experiencing inflation. Some readers mentioned the cost of feeding pets and other animals is also on the rise. I have a cousin who owns three horses. While we all love our pets, when the time comes for them to head for the great kennel in the sky, I wonder how much economics will factor into the decision about replacing them. I own four dogs. Dog food has increased from $17.00 to $25.00. Again, this is for the same bag of dog food! Big increase in feed prices for chicken feed and calf feed. I paid $13 for a 50# bag of poultry pelleted feed a year ago. I paid $17.80 yesterday. Calf feed went up over $13 for a 100# bag in August and has stayed there. We shop for groceries at a DISCOUNT, no-frills store, which is much less expensive than the grocery stores. In the past year, we have noted increases, gradually, in items that never went up. Cat food in a can has increased from $0.27 per can to $.50. We live in the Sacramento area. There are a lot of people who are already making tough decisions and adjusting. The increase in private, grade-school tuition is my biggest issue. It's becoming too expensive to be a good Catholic. As a single-income family of 5, I have no choice but to constantly think about saving. The little things we do change our lifestyles to compensate change in our inflation rate. When we switch from beef to pork we can't measure the true rate, because we have saved some of the difference financially while making up the difference in lifestyle. I have always done my own oil changes on my vehicles. I now change the oil filter every other oil change to save the cost of the filter. No more takeout lunches, and only one takeout coffee a day. Save, save, save! Sometimes I feel like a lean, mean saving machine, which doesn't make life as much of a pleasure as it could be. However not to complain; it is working. I am working, and the wolf is still stuck outside the door. We defend ourselves from inflation as much as possible by investing in home essentials, like energy. We've installed a solar water heater to eliminate the cost (and inflation exposure) of propane to heat water, installed a high-efficiency pool pump to dramatically reduce electricity consumption, and unplug appliances when not in use to eliminate phantom loads. These investments are guaranteed, inflation-proof, and tax free. The best kind… in my opinion. Greens fees at all three of the golf courses I play at regularly have increased about 10% over what they were 13 months ago. This has caused me to cut my three rounds weekly down to two. Also, local restaurants have boosted prices 5 to 15%. We now eat out once every two weeks, on average. I gift my wife with a simple bouquet of flowers each week, at a cost of a mere $4.99. (How simple can I get?) Last week, the cost of that simple bouquet went from $4.99 to $5.99 – for the same flowers, same number, same wrapping. That's a 20% increase! Umm, keep it up! It promotes family harmony. You certainly get the picture. Some folks added a bit of humor. I think a button with "WIN" on it would solve the problem, don't you? I mean... the government has to DO something, and a button is the clear answer. Who would do a silly thing like that? In the first phase of a tsunami (The "drawback"), people stand around the beach, wondering what is going on. Things look different from the shore. They can't put their finger on exactly what is wrong and they are unaware of the devastation about to crash down upon them. This is where I feel that we, as a country, are regarding inflation. People are beginning to realize that something is happening, but they are not sure why, and they are certainly not aware of the danger just ahead. Just like during a tsunami, they should take this opportunity to head, very quickly, for higher ground. The inflation in the USA feels like something is "stalking" you – not all the time; but it is definitely there. And some understand the effects very clearly. Anyone who has been living on SS [Social Security] checks since 2000 will tell you the same thing. They could not live on those checks alone, and depended on the interest they received from their savings accounts or CDs. They cannot do this any longer; they now need to withdraw principal or redeem some CDs just to make ends meet. This is not meant to debate the merits of the SS system, but it shows how inflation and the currency manipulation by the federal government is affecting those on fixed incomes with no hope of getting a raise. These people understand the effects of inflation more than any other group. These people live with fear every day, understanding they have little control over their financial future, while watching their life savings slowly vanish every year. So there you have it – a representative sample from our readers. Food, pet food, health care, insurance, taxes, and more are on the rise for the most of us. One respondent lamented that most of the increases are for staples and not the kind of things you can easily ignore. First and foremost, don't get too discouraged, and never, ever give up! We all may have to cut back, downsize, go back to work, or find alternate sources of income like annuities and reverse mortgages. We saved up our nest eggs with the idea that it would supplement our Social Security or pension, and now it is getting more difficult. Personally, I will be damned if I am going to throw in the towel! If it takes more time to study and learn about investments, so be it. I made that commitment to my wife and myself – and to you. I have learned the value of top-quality research, and the Money Forever portfolio is reaping the benefits of that research (we just recently celebrated when the 5th of our 6 dividend stocks raised its dividend payout amount). If you would like to learn more about our portfolio and premium publication and how to use our system to stay ahead of rising inflation, I invite you to click here. There are millions of retirees, seniors, and savers who share the same concerns. We are all fighting the inflation tsunami. Our subscribers are very like-minded when it comes to fighting for their portfolios; none of us is throwing in the towel. In the next article I will break down the results and suggest ways to meet the challenges brought on by inflation.